I never believed in love at first sight until this recipe. Call me shallow if you like, but I fell for the colours in this fish even before I had my first bite. Of course, colour is much more than just skin deep in this dish. I’m not just talking about how the beetroot cure seeping slowly into the flesh of the salmon leaves every opalescent slice with a crimson aura that fades into the salmon pink like a sunset over the sea. 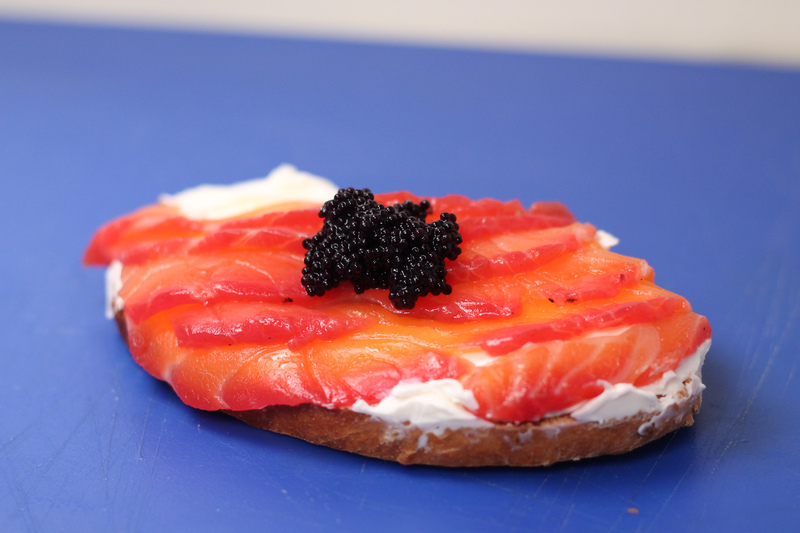 No – almost every ingredient in that we add to this salmon is marked by its relationship to a colour. The beetroot, infamous for its vibrant stain, is matched with zest of an orange – the fruit that takes such bold pride in its hue that they named the shade after it. The cure -BROWN sugar, BLACK peppercorns. (The dill, fresh and bright and grass-green though it may be, may be the exception that proves the rule). 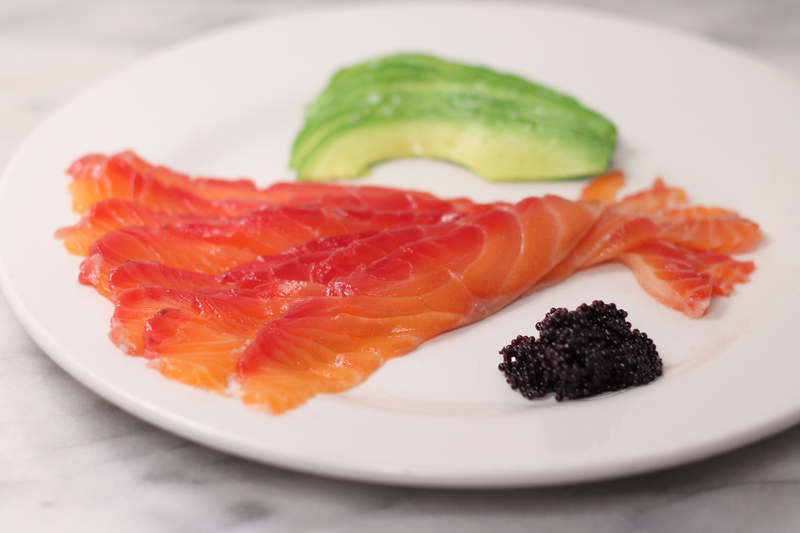 All of which makes pairing this salmon with inky caviar or slices of forest-green avocado almost irresistibly beautiful, combining the taste and appearance of a rainbow to the very idea of one. But there’s wisdom behind this beauty as well. The classic pairing of smoke and cured salmon is adored for its peaty darkness – the earthy, fruity flavour of the beetroot combines to similar effect. The orange provides the indispensable citric squeeze for the salmon. Orange and beetroot also play surprisingly well off each other. There’s a famous dish-come-playful study in colour by Heston Blumenthal. He serves “Beetroot and Orange Jelly” with the mischievous recommendation to “eat the orange one first”. The orange one, of course, tastes of beetroot and the beetroot-red one tastes of oranges. 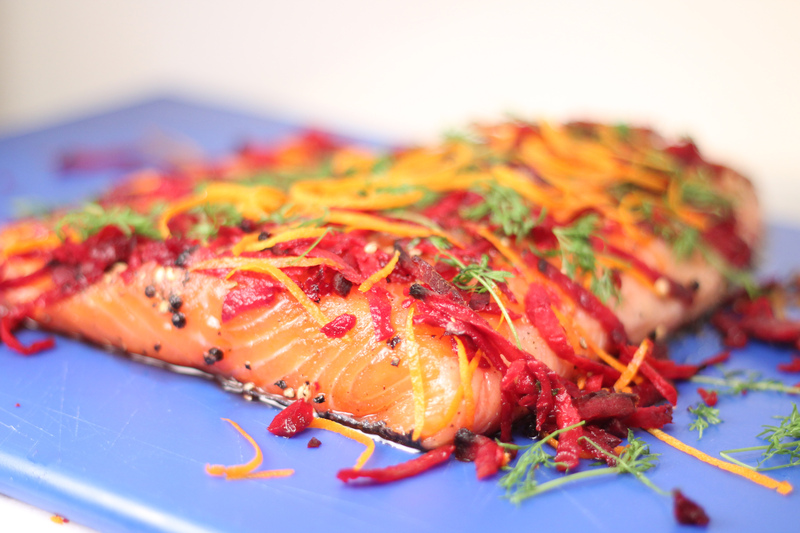 This beetroot-cured salmon does not aim to confuse though, only to delight. A riot of colour both on the plate and behind the scenes. The first bite is with the eyes, but a whole feast that lies beyond that. It’s something special, any way that you slice it. Combine salt, sugar, peppercorns and coriander to make the cure. Rub it all over the salmon on both sides, but especially the flesh side (it won’t penetrate the skin very much). Cover only the flesh side with the beetroot, dill and orange zest. Put the covered salmon in a zip lock bag or non-reactive container skin side up with the orange juice. Refrigerate for 4 days. 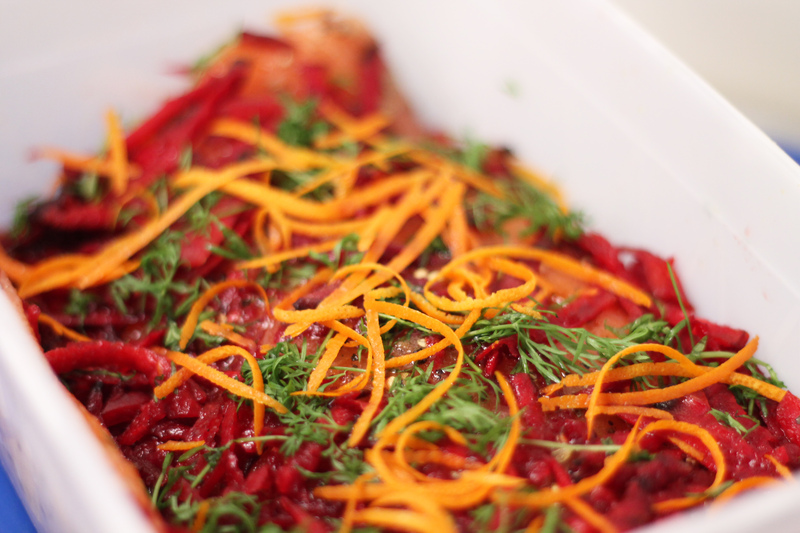 Drain off the accumulated liquid and discard it, along with the beetroot, dill and orange zest. Rinse off any remaining cure, pat dry and slice thinly cross-sectionwise. 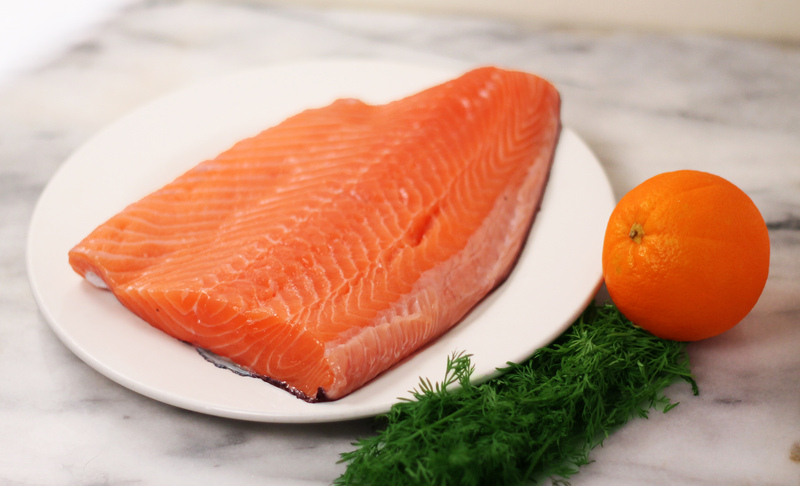 Once rinsed, the salmon can be kept in the fridge for up to 2 weeks, or frozen if well wrapped. Serve on toast with cream cheese and a squeeze of fresh lemon/orange juice, or with avocado, or (my personal favourite), on blinis with baba ganoush and roasted peppers. 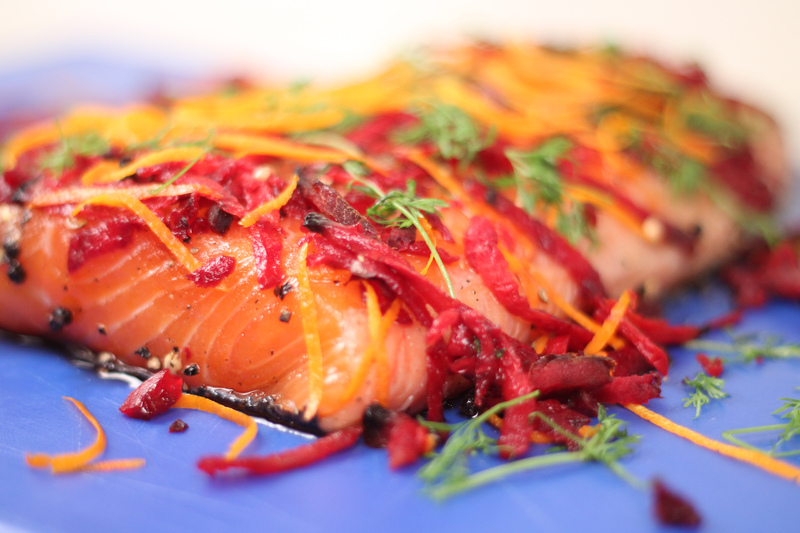 The colour from the beetroot penetrates into the salmon over time. I find the gradual fade from crimson to salmon-pink one of the most appealing things about the presentation of the dish. It’s achieved quite simply; the dye from the beetroot seeps in through the flesh as it cures, but it cannot penetrate the waterproof salmon skin. If left for too long it will eventually turn ALL of the salmon a crimson colour, which tastes completely fine but I don’t think is quite as pretty. I recommend putting the salmon skin side UP is in order to slow down the progress of the colour (gravity working against it). If you want it to colour more quickly, flip it skin side down and pile beetroot on top of it. 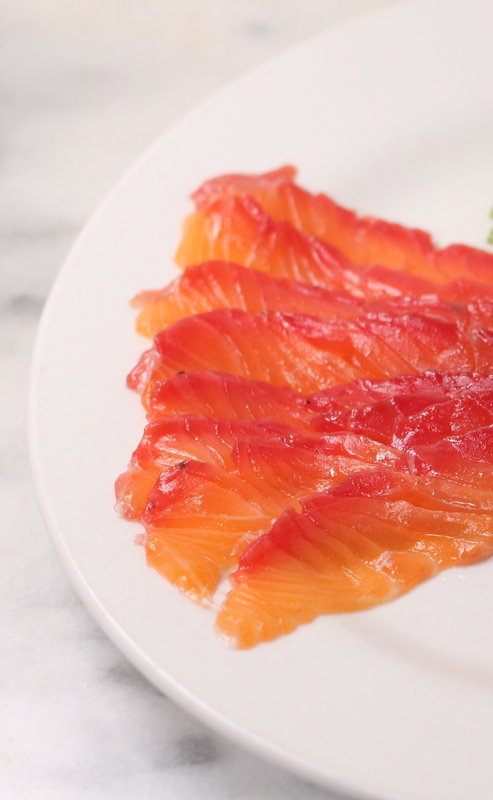 Smoked salmon is cured with salt and sugar just like this recipe prior to being cold-smoked. It’s the curing rather than the smoking that does the work of preserving the fish. For this reason, the texture of the beetroot-cured salmon is very similar to that of smoked salmon – use this as a guide to know if you’re doing it right. Heston’s jelly trick is accomplished by using the lesser known forms of each of his ingredients; golden beetroot and blood oranges. Clever, but unfortunately not much use for this recipe. I recommend slicing cross sections of the salmon fillet (if you’re not sure what I mean, imagine you were slicing a carrot into coins) because its the easiest to do with an unpracticed hand, and it’s the best way show off the colours fade into one another. If you have difficulty cutting without squashing it, you could try putting the salmon in the freezer for an hour to firm up a little. The skin is very hard to cut through, but it’s easier if you just leave it in one piece and cut the salmon off it slice by slice. The liquid that accumulates during curing is often quite tasty in small amounts, and is a vivid crimson colour. I occasionally reserve a few drops to garnish the plate with. Being cured is a partial protection against freezer burn, which occurs when water vapor in the air condenses on the surface of the fish or meat and goes through the cycle of evaporating and freezing and over as the freezer heats and cools from the door being opened. Wrap food well to avoid it. The cure I use in this recipe contains proportionally more salt (1:1 sugar to salt ratio) than last week’s recipe because, unlike with the pork, I’m not deliberately trying to make the salmon taste sweet. I highly recommend labelling any leftover portion of cure that you might have with its proportions. I rarely follow this recommendation, and never fail to curse myself for failing to do it.